Designing Monochromatic / Knit Quilts? Have to admit, I do miss web designing, particularly the graphic side. I was browsing a great LYS today (Kamille’s – Where Friends Wind Up in Gardener Village) and then through a quilt shop it occurred to me that I want to play with monochromatic design. 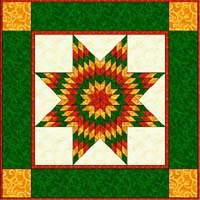 Something similar to star and/or round the world quilts done with such a theme plus perhaps one major accent color. Oh… and one of those delightful moments happened in the shop. As my friend and I were walking toward the door (uhhh after spending quite a bit of time doing the touchy, feely, is this the right weight, color for… thing) she stated I must be a great knitter. (nope, just love doing it) When we walked out, he turned to me and said, does she know you? No, hun, only in the way that knitters can spot each other a mile away. She was working on something a brilliant shade of green in a bulky wool (?). Can’t wait to go back to see how it’s coming along. knitted, say in blacks/greys – working on that through mentally. I’ve seen some beautiful knitting as ‘quilts’ but not very many using traditional quilt patterns. An example of the direction I’m thinking of can be found on ravelry. But again, want to play with color schemes a fair bit. Any ideas? thoughts? help? 😀 Pretty please? Go me…. or rather go mkdesigner. I found Classic Quilt Knitting Patterns with four volumes intended to use with Design a Knit Software. Definitely on the wish list. This entry was posted in Knitting and tagged knit, knitting classic quilt designs, monochromatic, quilt. Bookmark the permalink.